In 1890 Durham Meat Company, now Sierra Meat, was founded and named after the popular Durham breed of cattle. Now in its third generation of family ownership, taking a farm-to-table approach proved successful for Sierra Meat, allowing for an expanded product mix including bison, Wagyu beef, wild boar, natural beef, Berkshire pork, natural rabbit, national venison and game birds. Flocchini Sausage is Simple, Traditional and Satisfying. Handcrafted and made in small batches using traditional family recipes, Flocchini Sausage and Deli Meats have been simplified to use the fewest ingredients possible, focusing on whole muscle meats and only the finest herbs. A third generation company, Flocchini Sausage recipes are deeply rooted in rich heritage and intend to bring you the highest quality for a fair price. Durham Ranch Wild Boar consume an all natural diet, consisting of mostly acorns and brush. The meat is naturally lean and extremely high in protein. 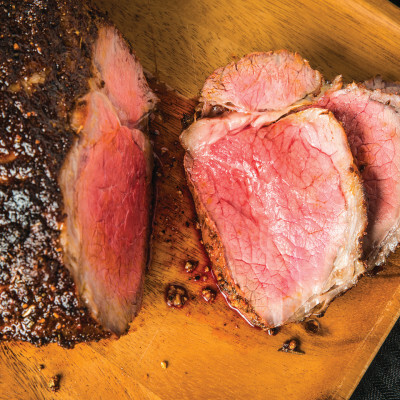 Its sweet, nutty, intense flavor makes Durham Ranch Wild Boar a natural choice for any restaurant looking for something truly unique and unexpected. Durham Ranch Wild Boar is free-range, 100% natural, low in fat and high in protein.